fnPad (pronounced "fun-pad") is a text editor based, graphing, programmable calculator. Arithmetic expressions are entered in a text window, and when calculated, by selecting the "Calculate" menu item, the results are inserted into the text following the expressions. The "jar" file [do whatever you've got to do with your browser to download the linked file] of version 0.32 (2010 Jan 9) can be downloaded. You need to have version 1.5 or higher of the Java™ Runtime Environment (available for Windows and Mac OS X). On some systems (e.g., Mac OS X), you can open fnPad.jar as you do other files, e.g., by double-clicking it. It can be run from a shell by the command "java -jar fnPad.jar". The syntax will be familiar to some, and is pretty simple anyhow. A little example follows. // and ends with the line. 3+8 ≈ 11 // Add two numbers. // when the "Calculate" menu item is selected. // Do multiple operations in an expression. // or associativity of operators. // Division of integers results in an integer. // results in a floating point number. // An expression ends with the line or at a semicolon. // Note that all of these calculations are done at once. More interesting things can be done by using definitions. // A definition can be an identifier = an expression. // Things that are defined can be used in an expression. // and occur in the text after being used. // than "b" in the "length(a,b)" definition. // There are some included functions and predefined constants. // and another, base 10 logarithm. Definitions can be recursive, in which case a conditional expression is needed. // Here are a couple of conditional expressions. // then the result is -x, otherwise the result is x. //    This ↑__________↑ parenthesis is for clarity. Any of the example text can be copied and pasted into a fnPad window. An example of graphing is shown in the image of a fnPad window below. See that graph(x,f(x)) is used to produce a graph of some function, where the first argument is some symbol (variable name) and the second argument is some expression that (usually) is a function of that variable. The extent of the coordinates may be specified, as in the example, with definitions of graph.x.min (for the minimum of the horizontal axis) and so on. If undefined, the extent of each axis is -1 to 1. 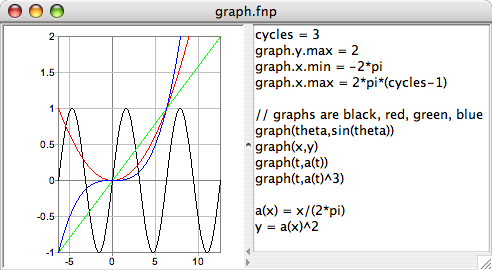 The color of each graph depends on the order of the graph() applications in the text. The light gray lines are the coordinate axes. To see the graph, the left-hand pane of the window must be opened, either by dragging the divider, or clicking on the "move divider right" control (if there is one in the interface). As can be seen, graph(x,f(x)) is different than other functions in two ways: it has the side effect of drawing in the graph panel, and it has no result. Another, less obvious way in which graph() is different is that its arguments are not directly evaluated when it is applied, but its second argument, f(x), is evaluated over a range of values for its first argument, x. // open the left panel. // Find the discriminant and roots. 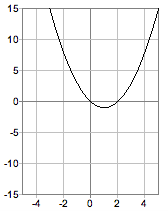 // Graph the quadratic function. // Define the graph's bounds. // Define the quadratic formula. There's another page with a more extensive example that applies the quadratic formula. The following are all the operators, lowest to highest precedence. Association is left, except for "^", e.g., a/b/c = (a/b)/c, a^b^c = a^(b^c). The following functions are included. The trigonometric functions use radians. Other functions, written in Java, can be added by deriving from the Function class. See cos.java for an example. The following "constants" are predefined. There are some missing basic things that need to be added. Here are the next planned major features.